Leigh's Fiber Journal: Computer Hex Code Dyeing 5: 1st Success? I'm not sure whether or not I can actually call this a success or not, but here it is. I will say with confidence that this is the closest I've gotten so far to my target blue. Is it exact? Even making allowances for the difference in media and electronic interpretations, I have to say no. Can I get any closer? I don't know. The recipe used the same color proportions as I used for the sample on the right (turquoise MX-G, 76%; red MX-5B, 10%; and black MX-CWA, 14%.) With that series of samples, I experimented with adjusting the amounts of fuchsia and turquoise. This lighter blue sample was the closest match to my cedar waxwing photo. For this newest sample, I dyed the yarn to a darker depth of shade (DOS), in this case 8%. Previously, my samples were 4% DOS. So, is 8% DOS dark enough to match the target color? From what I've read, the 8% DOS is considered "very dark" or "very intense." Can a darker DOS be achieved? I haven't found a reference to anything darker. Some of you with more dyeing experience will be able to answer that. Other possible experiments could include trying a different red (MX-8B), or a different black. My conclusions from these exercises so far, is that a color's computer hex code can be used as a starting point for dyeing with Procion MX dyes. However, the density of the dye powders effects their relative strength and has to be accounted for. Is there a specific ratio or some sort of formula for this? I don't know. Can one be developed? I don't know that yet either. Will I continue experimenting? Oh yes. Computer Hex Code Dyeing 4: 2nd Samples - Getting Closer? Leigh, when I look at the shading of the yarn in the photo, I see a blue that is almost exactly the blue of the computer color. Also, weighing the powders would mean that you wouldn't have to do the compensating you do when you use teaspoons, etc. And, last but definitely not least, congratulations! Wow, looks pretty close to my untrained eye! Congrats! Regarding your comment in the blog: "...However, the density of the dye powders effects their relative strength and has to be accounted for. Is there a specific ratio or some sort of formula for this? I don't know. Can one be developed?" Thank you Peg and Susan! Johanna, thank you for visiting and leaving a comment. Actually I did use Judy Walter's book to calculate my recipe, except my calculations were for sample skeins of yarn at 10 grams each. The strength of the dye powders I'm speaking of (perhaps not too well?) is what Walter's classes of dyes. When I first started experimenting, I took the hex code for a particular blue, calculated the percentages of cyan, magenta, and black from the hex code and simply substituted the same percentages of turquoise, fuchsia, and black. Of course, since the fuchsia dye powder is so much more dense, my result was definitely purple instead of blue. I started a series of experiments adjusting the ratios of the fuchsia and turquoise, until I got results close to my target color. What I'm wondering is, can I make the same adjustments every time I want to use a hex code to base a recipe on(!). Walter's book is the first source I've come across which gives me some concrete information about the dye powder densities. I agree with you that it is an invaluable resource. Density is also affected by humidity. The powder very readily absorbs water from the atmosphere. I keep my dye powders in a plastic box with a dehumidfying packet in it. Peg, I wondered about that. Since I measure my dye powders to make solutions out of doors, I am often very aware of the humidity. I already have to wait for non-windy days! With so many variables, I'm seeing that exactness of results is somewhat relative. If I can just get the results to be visually approximate, then I'll be happy. Leigh, unless you are going to market yarn or woven goods where colors absolutely must match, visual approximation is the way to go. The only time you would get into trouble is if you ran out of yarn in a project and had to dye some more. 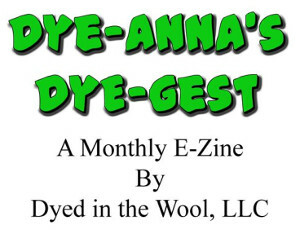 And we all know about buying different dye lots with knitting yarns......... So when I am dyeing weaving yarn, I always dye more than I ever think I will need. Way to go!!!!! Everyone's eyes are different not to mention our computer monitors so looks like its about as close as a person could get. Hurrah!! Leigh, what a success. On my monitor, the colors are very very close to one another, and so much more spot on that the first batch. You've really fine tuned this. Not to mention, I love a deep, rich blue -- and this one is just yummy! You did a great job with this last skein of yarn. Way to go!!! And thank-you for encouraging me to keep on trying. I mixed up some dye powder today and will let everything batch for 48 - due to using that slow poke turquoise. Thank you Jewel and Jane! I appreciate the encouragement. Peg and Bspinner, I've been thinking about this along a similar line. It would be easy to become obsessed with an "exact" match, but that would be difficult to analyze. If the colors of a photo appeal to me and I can get close enough so that their appeal isn't lost, then I will consider it a success. Diane, it turns out to be a lot harder than we first thought, doesn't it! I look forward to your experiments and your results. Thank you for a fascinating series of posts. I'm doing research in preparation for switching from Wilton cake icing colors to "real" acid dyes, and this gives me a lot to think about, and a lot of inspiration. Great job, and I can't wait to see your future experimentation! I like your experiment with your colors. I tryed this once with paints, picking sample cards of paint and then asking for the recipe to mix it. I was able to get the colors close enough. I use sabraset dye. I enjoy dyeing wool fiber. Keep up the good work. I myself are struggling with trying to make small samples of any color...really small 1 or 2 grms of fiber. Thank you for taking the time to leave a comment on my blog. Comments are always encouraging. The email I sent to your e-addy bounced back, but I did want to mention that I know what you mean about trying to mix amounts in small quantities. That was why I invested in a jeweler's scale that weighted down to hundredths of grams. Even so, color mixing and matching is a fascinating endeavor. I haven't worked with sabraset dyes before, but I got my dyeing start with wool. Cotton has been all new for me. I set dyeing aside for winter, but definitely plan to pick it up again when warm weather gets here. Do you have a blog? It sounds as though you should be recording and sharing your experiments.